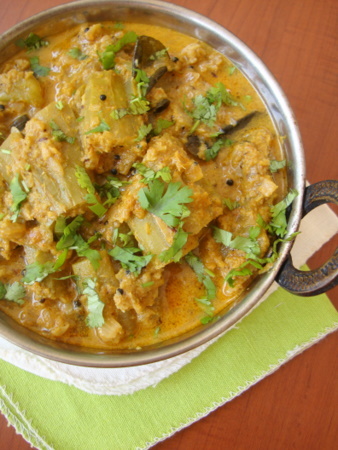 Ridge gourd is one of my favorite vegetables. 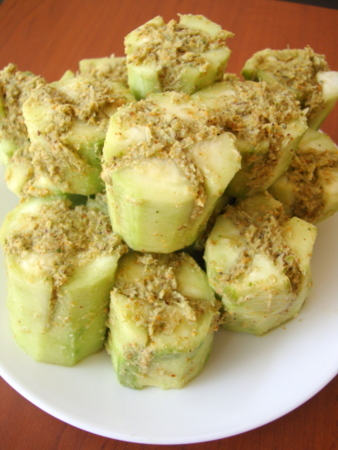 I love the combination of flavors in today’s stuffed ridge gourd recipe. Nutty sesame seeds, coconut and tangy tamarind are the secret weapons that lend that perfect flavor to the curry. Those allergic to peanuts can substitute with melon seeds or cashew nuts. Serve along with warm rice for a filling and hearty meal. 1 Take a tbsp of the paste and stuff each of the slit ridge gourd pieces. 2 Heat oil in a vessel, add the mustard seeds and allow them to splutter. Add the curry leaves and asafoetida and stir for a 5 seconds. Add the chopped onions and saute for 5 mts. Add the turmeric powder and mix. Place the stuffed ridge gourds in the pan and cook covered on medium heat. 3 After 4-5 mts, uncover the lid and turn the pieces so that they cook all over. 4 Cover and cook on low heat till the ridge gourds become soft. This could take about 16-17 minutes. Once in a while turn the ridge gourd pieces. 5 Add the tamarind paste and 1 1/2 cups of water and cook on low to medium flame for 15-20 mts. Sprinkle sesame seeds powder and mix. 6Turn off heat and serve with hot white steamed rice. This is very unique way to eating ridgegourd. Looks lovely and delicious. This dish looks great. I am a silent lurker of your site. I visit very often and have tried several dishes. I find your site very useful. The pictures look awesome too. Thanks a lot. Keep up the good work. I tried this dish and it is awesome!!! I will post this on my blog. Please feel free to comment on it. I love beearakaya in any form, but this recipe turned out too gud, thanks a lot! i love your recipes.Best of luck.